structural model is subjected to storey torques about the vertical axis, which have all the same sign and are equivalent to the storey lateral loads due to the horizontal component considered multiplied by its accidental eccentricity at the storey. The lateral loads are those calculated for the considered horizontal component of the seismic action according to the lateral force method of analysis (equations (D4.5) and (D4.7) with =2,), even though this method may not be applicable for the particular structure. In fact, this static approach of taking into account the effects of the accidental eccentricity is essentially the implementation of the displacement of masses by the accidental eccentricity with respect to their nominal positions within the lateral force method of analysis. In the context of the modal response spectrum method it would be more meaningful and closer to the concept of displacing masses to apply the static approach with storey torques computed as the storey accidental eccentricity multiplied by the floor mass and by the floor response acceleration in the direction of the considered horizontal component of the seismic action, computed from the modal contributions to such a floor response acceleration through the SRSS or CQC combination rule, as appropriate. The approach advocated by Eurocode 8 is computationally simpler, especially if in both horizontal directions the storey accidental eccentricity is constant at all levels (which implies constant dimensions of the building in plan at all floors). Then, it is sufficient to perform a single static analysis for storey torques proportional to the storey lateral loads from equation (D4.7) (with <PI = z;) for a base shear Fh of unity. The effects of the 'accidental eccentricity' of each horizontal seismic action component can then be obtained by multiplying the results of this single analysis by the product of the base shear Fb from equation (D4.5) that corresponds to the fundamental period of vibration in the horizontal direction of interest, multiplied by the (constant at all levels) eccentricity of this component of the seismic action. Application of the total storey torque to a single floor node of the storey (the 'master node') according to the previous paragraph, implies the floors must act as rigid diaphragms. 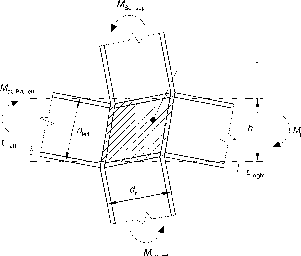 If the floor cannot be considered as rigid and its in-plane flexibility is taken into account in the 3D structural model, it is more meaningful to apply, instead of a storey torque, nodal torques at each node i where there is a mass m„ equal to the product of the accidental eccentricity and the lateral force determined from equation (D4.7) (with 4>t = z,) for that mass. Coming from a static analysis, the action effects of the accidental eccentricities have signs. As the sign of the accidental eccentricity should be taken such that the most unfavourable result is produced for the seismic action effect of interest, the action effect of the accidental eccentricity ex of the horizontal component X of the seismic action is superimposed on that of the horizontal component X itself, with the same sign as the latter. The outcome is the total seismic action effect of horizontal component X, Ex. It is these latter total first-order action effects that should be multiplied by 1/(1 - #,) to take into account a posteriori P-A effects. If an exact second-order analysis is performed, this has to be done both in the analysis for the horizontal component X itself and in that for its accidental eccentricity.